A real stalwart of the UK underground, Hypercolour have been pushing their unique brand of skewed, left-of-centre house & techno we love for as long as we can remember…a whole decade in fact. As many beautiful things do, it started off with two mates following a passion. Initially conceived as an outlet to share the unheard music pushed their way by friends – ten years down the line Hypercolour is a world beating imprint, nailing catchy as well as they do bizarre, stompers as they do blissed out – and releasing the likes of Laurent Garnier, Axel Boman and Groove Armada along the way. 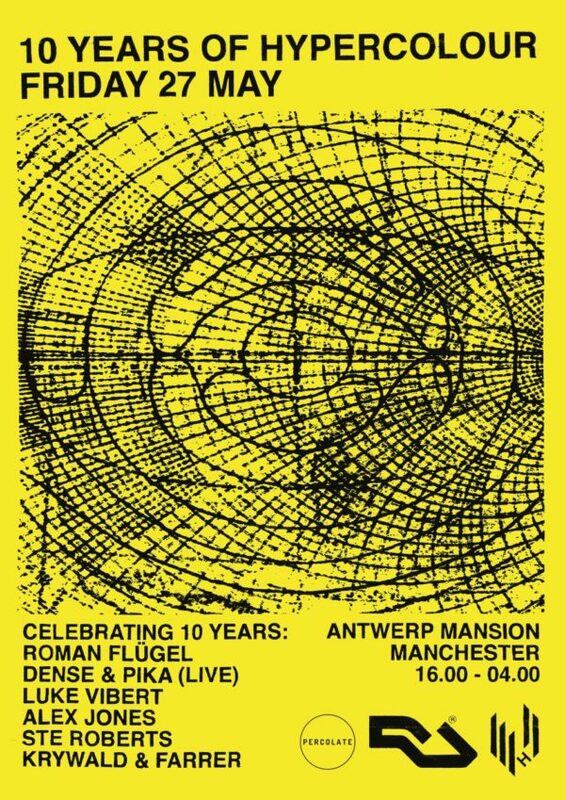 To celebrate the milestone, together we’ve assembled a crack team Hypercolour heads old and new for a day & night at the mansion – expect extended sets, tasty munch for a bite between dances, and tipples of choice to get those limbs warmed up. There could be no more fitting maverick to head up proceedings than the techno chameleon himself, Roman Flugel. From ambient electro excursions, through Villalobos-collaborations all the way to his famed bleepy techno numbers – he’s a restlessly creative producer and truly killer DJ – holding down a long-running residency at his hometown institution Robert Johnson. Can’t wait to bring him to Manchester for the first time in 3 years! As well as a solo set, Hypercolour co-bossman Alex Jones will join the author of the label’s first release Chris Spero (aka Glimpse) for a Dense and Pika live session. You don’t need us to tell you about their monster releases on Hotflush and Hypercolour, nor their incendiary live reputation – best to come see for yourself. UK rave mainstay and Hypercolour regular Luke Vibert rounds off proceedings – a bit of a legend we reckon. Part of a generation of truly groundbreaking UK artists he’s created stunning bodies of work across a number of aliases (Wagon Christ / Plug / Kerrier District) – having to call on a who’s-who of forward thinking electronic labels just to keep up with his hugely prolific output (Planet Mu / Warp / Rephlex / Ninja Tune). Joining the fun will be the final piece in the Hypercolour puzzle – newcomer A Sagittariun. A man of impeccable taste, he’ll be spinning one of his trademark understated-but-really bloody good sets. Happy Birthday Hypercolour, here’s to another ten.